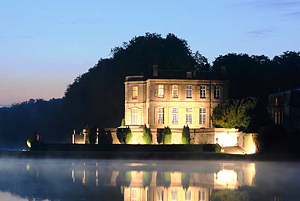 One of the most significant historical chateaux in France, Villette is both simple and sumptuous with the great octagonal salon in white and blue, the elegant dining room with the original 17th Century carved stone buffet, magnificent boiseries that has dessus-de-deportes by Francois Boucher, and the limestone entry hall which completely exalts the classicism of the 17th Century. All of the 18 bedrooms each with its own private bathroom were beautifully remodeled in 1999 to 2001. A Professional gourmet kitchen was installed in the year 2001 with top of the line commercial appliances in addition to two service kitchens, a gym, a billiard room and a banquet room. Telephone system is accessible from each room in addition to wireless Internet connection. There are numerous outbuildings including a spacious chapel and adjacent reception room, horse stable and greenhouse. The 185+ acres of garden was designed by Le Notre and spreads out behind the chateau in the central axis with two rectangular lakes filled with swans, ducks, birds and fishes, the spectacular cascade and fountain that resembles the one at Louis XIV's Chateau Marly, surmounted by a Neptune. The private and serene grounds provide numerous outdoor activities for the chateau guests, including jogging, biking, hunting, the swimming pool and newly built tennis court. Jules Hardouin-Mansart and Le Notre designed Versailles at the same time when they designed Chateau de Villette. Therefore Villette was nicknamed "Le Petite Versailles". A publishing phenomenon, Dan Brown’s #1 best selling novel “The Da Vinci Code” prominently featured Villette as the residence of central character Sir Leigh Teabing, a British royal historian who revealed the secret of the Da Vinci Code, the story of The Holy Grail and the relationship of Jesus and Mary Magdalene at Chateau de Villette (starting in Chapter 52 in the book). The story developed to the surprise discovery in the hayloft of the chateau’s barn and the escape of the characters through Chateau's 185 acres grounds.